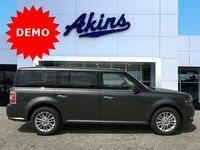 It may be best known as the most unique looking model of the Ford SUV lineup, but the 2019 Ford Flex lineup is far more than just its unparalleled style. In fact, the 2019 Ford Flex lineup is one of the most powerful, efficient and spacious Ford SUVs available – and we’ve got it right here at Akins Ford near Atlanta, GA. But how has the 2019 Flex lineup improved for the new model year? Well, that’s a question we’re going to answer right here with this 2019 Ford Flex versus 2018 Ford Flex head-to-head SUV comparison. In it, you’ll see the 2019 Flex didn’t need to improve all that much over an already impressive 2018 Flex lineup, but it does add a little where it counts. 287 HP & 254 lb-ft. Standard Horsepower & Torque 287 HP & 254 lb-ft.
365 HP & 350 lb-ft. Available Horsepower & Torque 365 HP & 350 lb-ft.
As you can see in our first Flex comparison table, the standard and available engines of the 2019 Ford Flex lineup haven’t changed at all when compared to the 2018 Ford Flex lineup, but that’s only because the pair of engine choices for both Flex lineups are as powerful as they come. Speaking of those engines, here’s where we come to our big change for the 2019 Ford Flex. Using new powertrain technology, Ford was able to get one more mile per gallon in the city and on the highway for the 2019 Flex lineup’s available engine. Other than that, the 2019 Flex lineup is just as efficient and spacious as the 2018 Flex lineup. 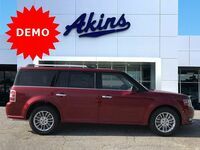 For more on the 2019 Ford Flex lineup and the 2018 Ford Flex lineup, please contact our staff here at Akins Ford near Atlanta, GA.